Eleanor is a social misfit. Her bright red hair stands out, she uses the wrong language, wears different clothes and she generally doesn't fit. She meets Park on the bus. Park is a social misfit. He sits alone, always listens to music and just seems different. Together they are the perfect pair. They laugh before they finish their jokes, talk about the same things, worry about the same issues, and confide in one another. I think this could possibly be one of Rowell's best books. It won the Goodreads Choice Award for 2013 (the year it was released) and warmed the hearts of many fellow readers. Eleanor has a horrible relationship with her family. It's actually not her fault at all. Her father, Richie writes horrible things on all her books and is a raging alcoholic. 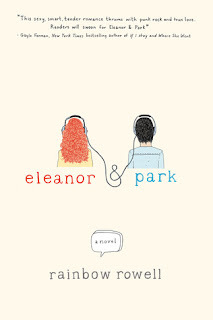 Rowell weaves a story where Eleanor finds solace in the family of her first love, Park. She also however, adds depth to the story by including various pages about Eleanor and Richie's background. The heart-breaking aspect of this novel was that Eleanor and Park both believed that their love wouldn't last, because they knew that first loves rarely ever do. Yet, they jumped right into it and never looked back. They are categorized to be perfectly normal and perfectly strange. Both characters share things with most people out there, but like all amazing characters are a unique blend of all our common traits, creating a diverse experience for the readers. It's such a hard book to review, because I feel that each tiny detail of this novel is best discovered by leafing through the pages yourself. Good luck to all of you who pick it up- and I hope that's at least a majority of you!